The online version of this article ( https://doi.org/10.1007/s13399-018-0307-9) contains supplementary material, which is available to authorized users. Efforts have been made to reduce the worldwide consumption of petroleum in response to increased awareness of the long-term environmental impacts caused by its utilization . These efforts are reflected in government mandates and incentives and also in research by the development of technologies for the production of liquid transportation fuels, chemicals and materials from biomass. This trend will lead either to the implementation of new technologies or the integration of emerging technologies with existing infrastructures. One infrastructure of particular interest in this context is pulp mills. Despite facing many challenges, such as shifting demand of different pulping products and the energy market situation, pulp mills have a great potential for diversifying their product portfolios and increasing their revenues through new biorefinery concepts [1, 2, 3, 4, 5, 6], where by-products/residues such as black liquor [4, 7] can be valorised. Various measures and integration investments have been carried out in recent years in pulp mills  to ensure an energy-efficient process which makes it possible to integrate new biorefinery concept with the present pulp mills and thereby allowing hemicellulose, extractives and/or lignin to be valorised further to form high-value products. The kraft process is the most common pulping process currently employed, accounting for more than 85% of the global lignin production: it amounts to approximately 63 × 104 tons annually , making this type of process of great interest as an obvious part in an integrated forest biorefinery (IFB). In this process, lignin is available in the black liquor, but is usually used as fuel to meet the steam and power needs of the pulping processes. Furthermore, the capacity of a mill’s production is often limited by the thermal flue gas capacity of the recovery furnace. Extracting a portion of lignin from black liquor presents an opportunity for a cost-effective approach for increasing the production capacity of the mill as well as the potential for using the lignin internally or externally, depending on the overall energy balance. 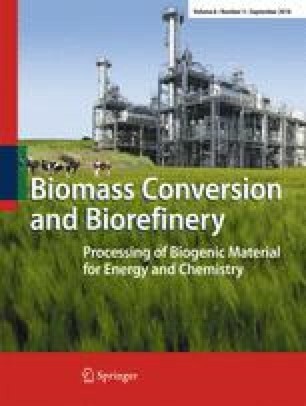 The recovery of lignin from kraft pulping is also being pursued actively as a resource from a biopower, biofuels and bio-based chemicals/materials perspective . Indeed, a relatively new method for separating part of the lignin from black liquor is the LignoBoost process, which has recently been commercialized. For instance, Domtar has implemented LignoBoost successfully in their kraft pulp mill in Plymouth, NC, USA [10, 11] and Stora Enso has installed a 50,000 t.p.a. LignoBoost plant at their Sunila mill in Finland [11, 12]. Lignin can be valorised via different routes: pyrolysis, gasification or hydrothermal liquefaction (HTL). Having a high-quality lignin in the pulp mills produced in the LignoBoost process represent a great potential of integrating these emerging technologies of lignin valorisation such as hydrothermal liquefaction (i.e. base catalysed depolymerisation in this case). This integration should consider technical constraints of a pulp mill, i.e. the chemical balance (especially the alkali ratio that should not be disturbed) and the energy balance. Base-catalysed depolymerisation (BCD) has been investigated extensively as a technique for the conversion of biomass in general and lignin in particular. The BCD process involves the utilization of bases such as K2CO3, KOH, Na2CO3 and NaOH to promote lignin degradation. Many studies have shown how crucial the choice of base is in lignin degradation [13, 14, 15]. Table 1 shows a summary of various parameters used in several studies on lignin depolymerisation using bases (homogenous catalysts). Strong bases, such as KOH and NaOH, have been used as homogenous catalysts in several previous studies. Roberts et al. , who investigated the degradation of organosolv lignin in a base-catalysed process at 300 °C and 25-MPa pressure and NaOH as base, showed that the product yields are influenced by operating conditions such as temperature, pressure, residence time and concentration of the base: when NaOH increased (from 2 to 4%) in the feed, the oil, oligomers and monomers yield increased. Toledano et al. tested different bases for organosolv lignin processed from olive tree waste and obtained catechol as the main product (0.1–2.4%); they found that the oil yield depended strongly on the base concentration: using NaOH gave higher oil yield than when using KOH (19.7% for NaOH vs 13% for KOH). Furthermore, Wang et al. found that base-catalysed treatment of various types of lignin led to many phenolic products with different yield distributions . Some studies have concluded more generally that using a base is important for promoting lignin degradation [13, 20]. Attention in these investigations was paid mainly to study the influence of various bases on product yields, which is an important part of developing a process that is both efficient and effective. The key question is the economic viability of this type of process: stand-alone technology may be too costly due to the logistics and high investment constraints involved, so a better alternative is to adapt emerging technologies to existing infrastructure. Most of the studies in Table 1 were based on organosolv lignin despite the fact that it hardly can be regarded as an industrial lignin. Thus, the knowledge is still limited regarding kraft lignin which is the major industrial lignin available, not only today but also in the future. The present investigation is a part of the development of a process for depolymerisation of kraft LignoBoost lignin with near critical water to transportation fuels and/or chemicals. In our previous studies [16, 21, 22, 23, 24], the dependences of potassium carbonate concentration, temperature, pH, recirculation ratio and phenol as capping agent and if methanol could replace phenol have been investigated as well as the storage stability of the produced bio-oil . All the investigations have been performed systematically using the same reference conditions (350 °C, 25 MPa, 5.5 wt% lignin, 4 wt% phenol, and 1.6 wt% potassium carbonate). The influence of temperature was investigated in five steps from 290 to 370 °C  and showed that the yield of bio-oil decreased slightly when the temperature was increased. The yield of water-soluble organics (WSO) as well as the char on catalyst increased slightly. The influence of homogeneous catalyst concentration and pH was studied by varying the amount of potassium carbonate  and, to be able to reach higher pHs, by adding different amounts of potassium hydroxide . The investigated pH interval was from 7.1 to 9.7 in the product and 0.8 to 1.5 unit higher in the feed. There was a minimum in the formation of char around pH 8.1 (in the product) and the amount of water-soluble organics increased with the pH, but the most significant result was that the formation of suspended solids (SS) was low until pH 8.1 and then increased considerably by increasing pH. The storage stability of the produced hydrothermal liquefaction (HTL) lignin bio-oil was investigated for temperatures from ambient up to 80 °C . The stability was shown to be good for the produced lignin bio-oil and if water and suspended solids were separated, the remaining oil showed almost no aging at all. A natural question is if the addition of 4% phenol in the feed as capping agent can result in an economically viable process. In a recent report , a number of emerging technologies, including HTL, for the production of transportation fuels from lignin of forest residues are compared and it was found that the use of 4% phenol in the feed is not likely to give a viable process. However, we investigated if another and lower phenol concentration could be used . The tests showed that it was possible to lower the concentration of phenol to 2% and still get almost the same amount of bio-oil as with 4% but at the expense of obtaining a more viscous oil. The yields of individual compounds were dependent on the phenol concentration but the total yield of bio-oil was not. The fraction of the phenol converted to other products was also lower for the 2% case. Calculations for the 2% case, using the same assumptions as in the report , showed that at this phenol concentration, the process was likely to be viable. In these studies, potassium salts (in the form of K2CO3 or K2CO3/KOH) were used in order to promote lignin degradation: as explained earlier, the focus was on the potassium ion rather than the sodium because of its high catalytic activity . On the other hand, it is known that the alkaline process streams in a kraft paper pulp mill contain a mixture of K and Na. The reason for this is that the make-up chemical is sodium-based, but wood contains potassium which is dissolved during the cooking operation. The alkali concentration, especially the ratio of sodium to potassium, in the pulp mill is an important parameter to control, and disturbances may affect several operations (e.g. cooking, evaporation and recovery boiler). It means that the alkali concentrations and the Na/K ratio should be kept to a certain level to ensure the steady operation of the pulp mill. In order to make integration of the HTL process with existing pulping process possible, it is important to study the effects of a Na/K mixture on the yields of products in the HTL process. The aim of this investigation is twofold: to study the effects of the Na/K ratios by using different concentrations and to investigate the possibility of using a concentration ratio of Na/K similar to the existing chemical streams in the pulp mill. Experiments were conducted in a small continuous pilot unit (Fig. 1), comprised of a fixed-bed reactor having a volume of 500 cm3 (Parr 4575), a recirculation, electrical heating, and feed and exit systems. The feed flow rate was 2 kg/h, resulting in an average residence of about 6 min. The electrical heating system was mounted around the piping, the feed tank and the reactor. The feed was first heated to 50 °C in the feed tank and then to 80 °C in the pre-heating section. The pressure of the feed was increased by using a high-pressure diaphragm pump. As we believe a high heating rate of lignin to be important in order to have high yields, we have chosen a reactor construction with recirculation. The recirculation flow was also powered by a high-pressure diaphragm pump. After being preheated to about 80 °C, the feed was mixed with the recirculation flow and was, thus, heated rapidly. If the mixing is good, this heating will be more or less instantaneous, but even in a worst case scenario (almost no mixing), heating through conduction from 80 to about 300 °C will not take more than about 4 s. This is much more rapid than what is possible (without special measures) to obtain for example in batch reactors. Jiang et al. had, for instance, a heating rate of 10 °C/min in their study of lignin depolymerisation using HTL. In all of the experiments, the reaction temperature was 350 °C the pressure 25 MPa and the ratio of recirculation-to-feed flow was between 4 and 5. Earlier tests had shown that lower ratios gave difficulties obtaining proper heating and higher ratios resulted in increased solids formation. The runs were carried out in the following steps: First, a lignin slurry was prepared by mixing LignoBoost kraft lignin (5.5%), deionised water and K2CO3/KOH and Na2CO3/NaOH bases that were used according to the ratios shown in Table 2. This mixture of lignin, water and bases was then dispersed using an Ultra Turrax disperser for approximately 10 min at room temperature. Phenol (4%) was added afterwards, when the slurry was heated to 50 °C in the feed tank. The deionised water was pumped through the system until it reached the operating conditions (350 °C, 25 MPa). Thereafter, a mixture of the slurry containing no lignin, i.e. just phenol, K2CO3/KOH, Na2CO3/NaOH and deionised water, was used as a feed for 1 h. Then, the lignin slurry in the feed tank was pumped in continuously, and steady-state was established after about 80 min. The period of the steady-state phase was 80 min, followed by a run-down period of 40 min. The liquid products were collected in a sampling bottle that was replaced every 20 min. The lignin used as the feed material in this investigation was a softwood kraft lignin produced by the LignoBoost process at the Bäckhammar pulp mill in Sweden. Its content of moisture was 32.6%, high heating value (HHV) was 27.7 MJ/kg, sodium was 0.09 mol/kg of lignin and potassium 0.03 mol/kg of lignin; its average molar mass was 17,000 g/mol . The heterogeneous catalyst zirconia (ZrO2) used in the reactor was supplied by Saint-Gobain NorPro, France length = 3 mm, diameter = 3 mm and BET surface area = 20 m2/g. Potassium carbonate (K2CO3, ≥ 99.5%); potassium hydroxide (KOH, ≥ 85%); sodium carbonate (Na2CO3, ≥ 99%) and sodium hydroxide (NaOH ≥ 85%) were used as the homogeneous co-catalysts and phenol (crystallized, ≥ 99.5%) was used as both the co-solvent and the capping agent. These components were all sourced from Scharlau Chemicals, Austria, and were used as received. The bio-oil and aqueous phases were separated by centrifugation; each phase was subjected to different analyses, according to the sequences shown in Fig. 2. A detailed description of characterization methods and analytical methodology have been reported previously and can be found elsewhere [16, 21, 24]. Analysis and separation sequences of the product mixture. GC-MS = gas chromatography mass spectrometry, GPC = gel permeation chromatography, TOC = total organic carbon, TC = total carbon, K/Na = potassium and sodium, resp. The bio-oil was fractionated into three parts, namely light oil (diethyl ether (DEE)-soluble fraction), heavy oil (DEE-insoluble but tetrahydrofuran (THF)-soluble) and suspended solids (THF-insoluble). Fractionation was performed via solvent extraction, filtration and vacuum evaporation. Identification and quantification of the major phenolic compounds present in the light fraction were performed by gas chromatography coupled with a mass spectrometry/flame ionisation detector (GC-MS/FID). The total amount of bio-oil also had its water content determined by Karl Fischer titration. Elemental analysis of the bio-oil was performed at the Mikroanalytisches Laboratorium Kolbe, Germany. Analyses were carried out to determine the contents of carbon, hydrogen, potassium and sulphur: CHNOS was used for carbon and hydrogen, atomic absorption spectroscopy for potassium and ion chromatography for sulphur. In the case of the aqueous phase, a sample was withdrawn and acidified to pH 1.5–2.0 before being extracted using DEE. It was then characterised using GC coupled with MS. Complementary total carbon (TC) and total organic carbon (TOC) analyses were performed using a Shimadzo TOC 5000A (680 °C combustion catalytic oxidation method) to characterize the water-soluble organic fractions. The char that was formed on the catalyst during the operation was determined as follows: After the reactor system cooled down, the catalyst particles were recovered, and a portion of the catalyst was sampled. This sample was dried in an oven at 105 °C for about 24 h. Thereafter, the sample was weighed. Then, it was regenerated at 500 °C for 12 h to remove char/organic substances. Afterwards, the sample was cooled then weighed again. Thus, the yield of char on a dry lignin basis could be calculated for each experiment, by knowing the total mass of dry catalyst before the experiment in the reactor. This study deals with the influence of changing proportions of Na and K in the alkali added as co-catalyst for the lignin depolymerisation. Except for the feed concentrations of K2CO3, KOH, Na2CO3 and NaOH, the reaction conditions were thus kept fixed. In order to also keep the inlet pH fixed, to cover the whole range from only K to only Na, and to emphasise Na to K ratios similar to those commonly found in pulp mill streams, the added amounts of the individual alkali salts were varied as follows: run A is the reference test with 100% potassium ion (0.3% KOH and 1.6% K2CO3), then the replacing of K ions by Na ions was done in a way that there was an equivalent number of mole of Na for each mole of K replaced. Thus, potassium ions from the weak base K2CO3 was replaced by the weak base Na2CO3; the strong base KOH was replaced by the strong base NaOH. The calculation in percentage gave the values shown in Table 2. In the following sections, and for reasons of simplicity, the different inlet concentrations chosen are designated by their ratio of moles of Na to the sum of moles of Na and K, i.e. by Na/(Na + K). This investigation aimed at investigating how different ratios of sodium and potassium influence the depolymerisation of softwood kraft lignin. The results obtained for the measured amounts of sodium and potassium in the aqueous phase and the pH of the product are reported in Table 3. The mass balance of potassium and sodium between the feed and product was fairly consistent, with differences that can be attributed to experimental uncertainties. By comparing the measured amounts of sodium and potassium in the aqueous phase (Table 3) and in the bio-oil phase (Table 4), it was found that most of alkali ended up in the aqueous phase, with an average of 94% for potassium and 91% for sodium. Moreover, the Na/(Na + K) ratios in both the feed and the aqueous phase were almost identical. This comparison between the feed and the aqueous phase indicates that the latter could be the main source for recycling potassium and sodium, while the fraction of sodium and potassium remaining in the bio-oil might pose difficulties in its further processing. In the case of there being a mutual exchange of sodium and potassium between an HTL process and the chemical stream in a pulp mill, it might be possible that the streams in the pulp mill can be used as a way of adding alkali to the HTL process. The pH was measured in the feed and the product; no significant difference was found in the pH of the feed (9.4 ± 0.2) with different sodium fractions in the feed. The same observation was made for the pH in the product (7.5 ± 0.1). For definitions and assumptions regarding yield calculations, see the Appendix section. Figure 3 shows the yield distribution of water-soluble organics (WSO), bio-oil and char on the catalyst, with the first two being determined on a phenol and water-free basis. The sum of these two product yields, WSO and bio-oil, are between 85 and 88%, which means that the lignin conversion into valuable products was not affected strongly by varying the sodium fraction. This suggests that using the ratio of sodium/potassium that already exists in the chemical stream in a pulp mill (for a sodium fraction between 0.5 and 0.9) for an HTL process will not affect the overall yield of lignin depolymerisation products. The sum of the yields (bio-oil, WSO and char) for different Na/(Na + K) ratios was consistent and varied between 99.8 and 102%. Regarding the formation of char on the catalyst, no significant effect was observed: the char yield on the solid catalyst was (14.6 ± 0.7)% in the entire Na/(Na + K) range. Shifting to sodium as a co-catalyst in the feed would therefore not lead to increased repolymerisation and condensation reactions. To verify a possible char formation from added phenol in the feed, a blank test has been carried out in a previous investigation  using similar condition as in this study but without lignin. The results showed that no products similar to those from lignin degradation were obtained. It should be noted that the yields of bio-oil given in Fig. 3 include the suspended solid fraction, i.e. the THF insoluble fraction. Suspended solids might be considered as being a non-desirable/low value product, e.g. due to its solid form and its low H/C ratio, which limits its possibilities for further valorisation. The suspended solids and water-free bio-oil yield was found to be (59.1 ± 3.1%). Figure 4 shows the fractions of suspended solids (SS) and heavy oil found in the bio-oil for feeds with different Na/(Na + K) ratios. As can be seen, for Na/(Na + K) ratios higher than 0.8, the SS yield decreases as the concentration of sodium in the feed increases. Thus, changing the catalyst from potassium to sodium might have the positive effect of decreasing the formation of suspended solids, which is in line with the findings reported in Toledano et al. .
For water-soluble organics, comparing the yield of WSO in runs A (100% potassium) and E (100% sodium) shows that both experiments gave relatively similar results (11.4% for run A vs, 12.1% for run E). The same observations can be made for char (14.6% for run A vs. 14.5% for run E) and bio-oil (73.5% for run A vs. 73.8% for run E) yields. This is in agreement with the findings of Miller et al. , who studied the conversion of organosolv lignin using various different bases. The fact that Na and K give about the same yields in this investigation does not necessarily mean that they have similar activities with regard to the depolymerisation of lignin. It could very well be that the residence time used for all experiments in this study (about 6 min) was sufficiently long for complete degradation of the lignin to be reached for both types of alkali. That we have a complete degradation is supported by an NMR investigation of the bio-oil in run A reported by Lyckeskog et al. , where it was shown that this bio-oil did not contain aliphatic inter-unit linkages typical for lignin, thereby indicating that the lignin had been effectively depolymerized . In order to obtain some insight into the role of the solid catalyst (zirconia), two runs have been performed: one with zirconia catalyst and one with only spherical glass beads as reactor filling, with otherwise equal operating conditions and feed composition (4.1% phenol, 5.5% lignin, 1.6% K2CO3; at 350 °C and 25 MPa).. The results showed almost similar overall yields. However, the light oil fraction in the total bio-oil was different, 8.4% for the run without zirconia vs. 15.9% for the run with zirconia. This is in line with the findings from GPC analysis of the bio-oil fractions where it was shown that bio-oil from the run without zirconia had higher average molecular weight (30 kDa) then the bio-oil from the run with zirconia (18 kDa). This indicates that during lignin HTL, the zirconia catalyst has probably a catalytic activity giving lower molecular weight compounds than in the glass beads case. However, a further, more detailed, study about the zirconia role is needed to obtain a conclusive comparison. Table 4 shows the results obtained from the elementary analyses of the bio-oil and lignin used, together with their calculated higher heating values. It shows that the contents of S, C, H and O in the bio-oil were about the same for all feeds, regardless of their Na/(Na + K) fraction. The amounts of Na and K in the bio-oil fluctuated a little compared to their respective trends in the feed, and is probably due to the low contents of K and Na in the bio-oil. When the calculated higher heating value of the bio-oils in runs A to E are compared, no significant difference was seen when the potassium ions were replaced by sodium ions in this HTL process. As reported in Section 2.1, the bio-oil was fractionated into three fractions, namely light oil (diethyl ether (DEE)-soluble fraction), heavy oil (DEE insoluble but tetrahydrofuran (THF)-soluble) and suspended solids (THF-insoluble). From Fig. 4, it can be seen that the former was fairly constant up to an Na/(Na + K) ratio of 0.8 and then increased from 22.4 to 37.7% (i.e. showing a decreasing trend as more potassium is present in the feed). Comparing SS in the same way, it can be seen that more sodium in the feed leads, for Na/(Na + K) ratios higher than 0.8, to a bio-oil with a smaller fraction of SS. This suggests that using a feed containing greater amounts of sodium contributes further to lower amount of suspended solids being formed but increases the levels of the heavy oil fraction. The different Na/(Na + K) ratios in the feed did not influence the total yields of anisoles, alkyl phenols and phenolic dimers notably: they were found to be (6.5 ± 0.5%), (5.8 ± 0.6%) and (1.9 ± 0.3%), respectively. The results for guaiacol (see Fig. 5) also showed a stable yield in this study when the Na/(Na + K) ratio was altered which, along with the fact that other studies [30, 31] consider guaiacol to be an intermediate product of lignin degradation, suggests that changing the process catalyst from potassium to sodium does not strongly affect the further conversion of guaiacols into a product of lignin depolymerisation. This is in line with the results obtained by Toledano et al. ; they found that when no base is used in the BCD, the amount of guaiacol is higher than when it is used, thus providing a clear indication of the role of the base in the process of lignin degradation. The same observation can be made for the formation of phenolic dimers, which was stable when the concentration of sodium in the feed was increased: feed containing greater amounts of sodium do not lead to the extensive formation of compounds of higher molecular weight, i.e. phenolic dimers. The most dominant phenolic compounds present in the bio-oil phase were found to be anisoles, guaiacols and alkyl phenols; their yields were relatively stable (6.0 ± 0.5%, 3.0 ± 0.3%, 3.5 ± 0.6%, respectively) when the Na/(Na + K) concentration ratio was increased. The same observation was made for these compounds in the aqueous phase (anisoles (0.6%), guaiacols (1.6 ± 0.3%) and alkyl phenols (2.3 ± 0.2%)) with the exception of catechols, which showed a higher yield (6.1 ± 0.4%) at 0.5 and 0.8 Na/(Na + K) ratios. Table 5 shows the fractions of the various individual compounds, and their respective groups of compounds, found in the bio-oil and aqueous phases. One major, individual, compound of the alkyl phenol group identified by GC-MS/FID was o-/p-cresol. This type of compound is dependent on the concentration of phenol in the feed, as was found in an earlier investigation . In the current study, the amount of phenol was kept fixed and only the concentrations of sodium and potassium were varied. It is clear from Fig. 6, which shows the amount of o-/p-cresol at the reactor outlet vs. the Na/(Na + K) ratio in the feed, that changing the Na/(Na + K) ratio has only a minor effect on the formation of this type of compound. This suggests that for the condition investigated in this study, sodium and potassium catalysts exert the same effect on formation of alkyl phenols (for other alkyl phenols compounds, see Fig. S1 in the supplementary material), and likewise for methoxyphenols (for guaiacol, cresol and 4-ethyl-2-methoxyphenol, see supplementary information, Fig. S2). For the conditions investigated, it was found that it is possible to use Na/K ratios similar to those in a kraft pulp mill and to shift the catalytic system from potassium to sodium, keeping the overall yields of the products fairly constant. Moreover, using a greater amount of sodium than potassium in the feed resulted in less suspended solids being formed in the bio-oil. This study opens up for integration with the pulp mill in different ways. The authors would like to thank their colleagues in the laboratory at the Water Environment Technology Division (Chalmers University of Technology) for their contributions to the TC and inorganic carbon (IC) analyses. Thanks are also extended to Ms. Ximena Rozo Sevilla for her assistance with the GPC and GC-MS analyses and Dr. Lars-Erik Åmand for his technical support. This work is supported by grants from Chalmers Energy Initiative, Valmet AB, and the Swedish Energy Agency (project P40521), which we gratefully acknowledge. The monomer fractions were determined by the approximate quantifications provided by GC-MS/FID. The bio-oil fraction shown in Eq. (2) was adjusted by the water content and included the fraction of suspended solids. The yield of water-soluble organics was determined by the TOC results, assuming that the primary organic compounds in the aqueous phase had phenol-like molecular structures. The reacted phenol was assumed to be the amount of phenol that has been reacted during the lignin degradation process, and was calculated using the amounts of phenol measured in the feed and the product. Identification and quantification of the major phenolic compounds present in the light fraction were performed by gas chromatography coupled with mass spectrometry detector (GC-MS) for runs A, D and E, while gas chromatography coupled with flame ionisation detector was used for runs B and C.
The amounts of monomers determined by GC-FID (except for phenol) were calculated using a theoretical response factor based on the correlation of de Saint Laumer et al. . The calculation for phenol used a concentration-dependent response factor experimentally determined for the MS and FID detection, respectively. The phrase “phenol-free” indicates that the amount of phenol measured in the product material (i.e. in the aqueous phase and the bio-oil) reported by GC-MS/FID is excluded. where C, H, O, N, S and A are the carbon, hydrogen, oxygen, nitrogen, sulphur and ash contents of the material, respectively, expressed in mass percentages on a dry basis. Supplementary material comprises four pages and includes three figures: Figs. S1, S2 and S3, and two tables: Table S1 and S2.